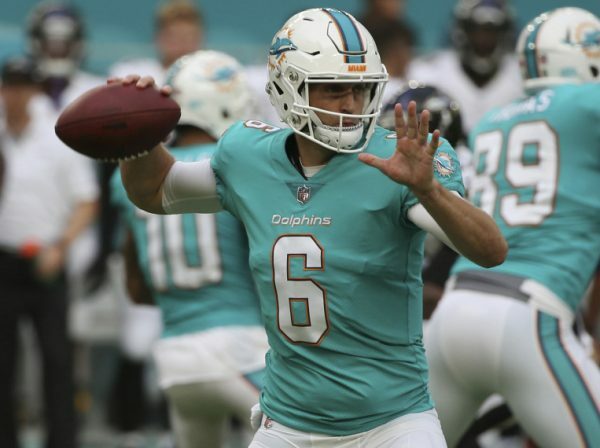 Miami Dolphins quarterback Jay Cutler went down with a chest injury early in the third quarter vs. the New York Jets on Sunday and is questionable to return to the game. Backup Matt Moore replaced Cutler after the 12-year pro was ushered into the team’s locker room. According to USA Today reporter Antwan V. Staley, cheers could be heard as Moore took the field. Cutler has had his ups and downs as the Dolphins’ quarterback this season, but his play has improved over the last two weeks with four touchdowns and only two interceptions. Before Cutler left Sunday’s game he had gone 12 of 16 for 138 yards, two touchdowns and an interception. Late in the third quarter, the Dolphins trail 28-14 to the Jets, if Moore is forced to serve as the starter for the rest of the game he will look to replicate his performance from last year when he filled in for an injured Ryan Tannehill and passed for eight touchdowns and 721 yards in three starts.